Sport plays an important part in the life of a Mount Alvernian. Sport not only aids our young girls to remain healthy and have a positive outlook, but also enables them to develop skills in teamship, resilience, and other competencies. 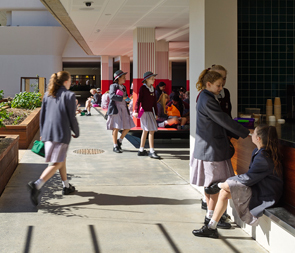 All students benefit from the diverse range of sporting opportunities offered through physical education, interhouse and interschool sport, tournaments, carnivals, and lunch-time competitions. There’s something for everyone from competitive team sports such as hockey, netball, futsal, and volleyball, to social sports like bowling, rock climbing and zumba, as well as individual sporting pursuits such as cross country, swimming, athletics and triathlons. The emphasis of our sporting program is participation, cooperation, team spirit, and having fun. Students of all abilities are involved, and there are opportunities for talented students to be selected for district, regional, and state teams. Committed coaches work with students to help them improve and achieve their best in their chosen sports, typically training once or twice per week either before or after school, and competing at a central venue around Brisbane. Participation in most sports offered involves no extra cost. Please check the individual sport tabs for details. Like us on Facebook (Mount Alvernia College) where you’ll find lots of up-to-date information about sports trials, training, and competition results. Download the College App. Mount Alvernia participates in the Catholic Secondary Schoolgirls’ Sports Association (CaSSSA) fixtures, competing in the following sports: Volleyball, Australian Rules, Indoor Cricket, Tennis, Netball, Football, Hockey, Touch Football, and Basketball. AFL Queensland is committed to providing pathways for women and has been working in conjunction with CaSSSA to offer a tailor-made AFL program suitable for players of all abilities. This program consists of a junior and senior division, with all players participating in a combination of skills sessions lead by qualified AFL coaches, as well as competitive interschool games. The exciting modified playing format (with a maximum of nine players on the field and mandatory position rotations each half) facilitates open play and ensures all players are given opportunities to get involved. Mount Alvernia also participates in the Youth Girls Cup, a fun, friendly carnival day for secondary school female students. Our athletics program begins with pre-season training in June and culminates with our team’s participation in the Catholic Secondary Schoolgirls’ Sports Association Carnival held in August. Participation is the key to success in our Interhouse Athletics Carnival, with all students encouraged to get involved and have a go. To encourage participation, Year 7 students attend an athletics excursion prior to the Interhouse Carnival to introduce them to events which are not traditionally part of primary school athletics programs like hurdles, flop high jump, triple jump and javelin. The interhouse carnival is held at the UQ Athletics Centre, which boasts an Olympic standard eight-lane synthetic track, and track-side grandstand which creates a great house carnival atmosphere. Students interested in being part of the athletics team are invited to attend an annual Athletics Camp held at the Sports Super Centre at the Runaway Bay Sport Super Centre during the June/July school holidays. Through this, and our ongoing coaching program, students are instructed by qualified athletics coaches to help them improve their technique and achieve their best. 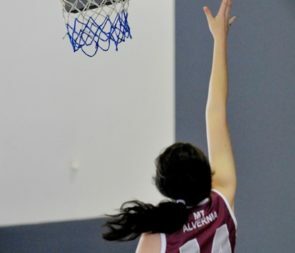 Both beginners and skilled basketball players enjoy fun team spirit and competition as part of Mount Alvernia’s basketball program. Opportunities are available for any skilled players to participate in the Open team. We participate in CaSSSA’s Wednesday afternoon fixtues. Our Open team also is given the opportunity to compete against other school teams in the Queensland Basketball Championships Schools Tournament. Our dedicated Cheersport team trains year-round, working on their fitness and learning new skills under the expert eye of Coach Sanford McMurray, Founder and Director of Cheersport Australia. The team puts its skills on display, competing against school and club teams in various tournaments throughout the year. All students are welcome to join the Cheersport team. There is a small annual cost associated with this activity. Our Cross Country season starts in Term 4 and culminates with our team’s participation in the Catholic Secondary Schoolgirls’ Sports Association Carnival held in May. 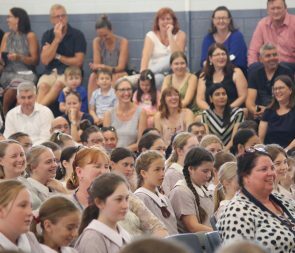 The Cross Country Interhouse carnival is held in Term 1, and each student is encouraged to get involved and compete for her house. Students interested in being part of the Cross Country team are invited to attend morning training sessions held at school with our experienced coaches and take part in numerous lead-up meets throughout the season. Mount Alvernia’s biennial European Football Tour, along with the school’s participation in a wide variety of football competitions, ensures students of all abilities are provided abundant opportunities to develop and practise their football skills. As part of the tour, students train at some of the world’s leading football academies, participate in stadium tours, play against local school and club teams, and experience live Premier League or La Liga games. This places them in good stead to transfer their newly-acquired skills to the field during inter-school games. In addition to the regular Wednesday CaSSSA fixtures, teams participate in the Uhlsport Cup, the ISSA Cup, and the Bill Turner Trophy. Mount Alvernia has enjoyed success on the futsal court, with teams progressing to the national finals and students selected to represent Queensland and Australia on a number of occasions. Our futsal season begins with trials in February. Junior, intermediate and senior teams compete in the South East Queensland Futsal Championships for the opportunity to progress to the Champion of Champions in July, and ultimately the Australian Futsal Championships held annually in November. During these carnivals, Queensland Futsal identifies students for selection into a number of state representative teams. Mount Alvernia has a well-deserved reputation for excellence on the hockey field. Our enthusiastic team is a mixture of ages and has performed strongly for a number of seasons. All games are played in great spirit, ensuring all players are involved and have a fun experience. We field many teams and have had great success recently in the CaSSSA Indoor Cricket competition. With games held locally at Toombul Indoor Sports, this is a great sport for all students to get involved in and try. Teams also train at Toombul under the guidance of experienced coaches and learn all of the skills needed in this great team sport. Netball has traditionally been a popular sporting choice among Mount Alvernia students, with over twelve teams of varying ages and abilities participating in weekly matches. In addition to the regular weekly interschool netball competition, students selected in the Open and A division netball teams are also given the opportunity to participate in various Netball Queensland tournaments such as the Vicki Wilson Cup, QC Cup, and QISSN (Queensland Independent Secondary School Netball). In 2017 Mount Alvernia hosted the Queensland Independent Secondary Schools Netball tournament. Rugby 7s is very popular at Mount Alvernia College. Our experienced coaches work tirelessly with the students in all aspects of rugby to ensure they are fully prepared for game days. Teams compete in various tournaments and carnivals throughout the year in a variety of age groups. Weekly Strength and Conditioning sessions are held at school throughout the year. The aim of the program is to develop core strength and improve overall fitness in a fun environment, which will benefit students in all sporting pursuits. Our swimming program begins with pre-season training during Term 4 and culminates with our team’s participation in the Catholic Secondary Schoolgirls’ Sports Association Carnival held in March. With swimming as our first Interhouse carnival for the year, all students are encouraged to get involved and have a go. The Interhouse carnival is held at the Centenary Aquatic Centre and is always a highlight as each house battles it out for the first victory of the year. Students interested in being part of the swimming team are invited to attend morning training sessions held at school and are able to attend the annual Swimming Camp held at the Sports Super Centre at the Runaway Bay Sport Super Centre. Mount Alvernia’s tennis program offers professional coaching and fixtures for players of all ages and abilities. Our association with Shaw Park Tennis Centre, voted Number 1 Tennis Centre by Tennis Australia, ensures access to quality facilities and expert coaching for all players. Our variety of teams caters for all students, whether they are new to the game, keen to get back into it after a break, or take their tennis a little more seriously. As CaSSSA Tennis fixtures are played on Saturdays, tennis is a great way for students to socialise, keep fit and have fun outside of the traditional school environment. There is a small annual fee associated with this sport. Touch Football is a popular interschool sport at Mount Alvernia, with over twelve teams involved in all levels of the interschool competition. In recent seasons, students’ enthusiasm on the touch field has been rewarded with not only good results, but an exciting competition and team atmosphere. Mount Alvernia’s Triathlon Club enables students to enjoy the challenge and variety of triathlons. Students receive expert cycling guidance during weekly training rides. This instruction, coupled with our cross country and swimming programs, provides students with perfect preparation for the Gatorade Triathlon Series, in which we have competitors in both team and individual events. Students are also given the opportunity to trial for the Met North Triathlon team. Mount Alvernia participates in the CaSSSA volleyball competition, with Junior, Intermediate and Open teams involved in Wednesday afternoon fixtures. The variety of divisions ensures players of all abilities are catered for, and offers a great opportunity for those new to the sport to learn skills in a fun team competition, while at the same time ensuring challenging matches for competitive teams.